Connect to your financial data in minutes with ConnectWise Manage and QuickBooks Online! Take control of your day-to-day business finances with QuickBooks Online, a leading software-as-a-service financial management tool. Designed for established small businesses, QuickBooks Online helps you manage your accounts with ease and accuracy, saving you time so you can focus on growing your business. Auto-creation – The integration will automatically create new customers, vendors, and products in QuickBooks Online for any records that do not already exist. Single record batches – Every transaction is batched over to QuickBooks Online individually as a single record batch; so, un-batching transactions is much easier if the need arises. Sync All – Sometimes it’s nice to be able to have a higher view of transactions; so, with this option, you can simply sync all pending items with the click of a button. Transactional Validation – All transactions are validated during the batch to ensure that the data that arrives in QuickBooks Online is accurate. 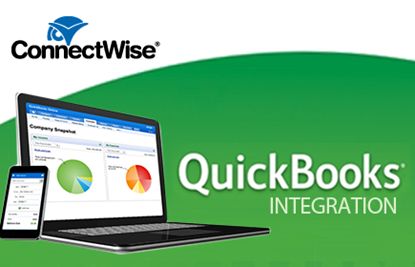 Online Payment – Easily allow for online payments of your ConnectWise Manage invoice within QuickBooks Online. Sync Payments – Update the payment status from QuickBooks Online to ConnectWise Manage to reflect an up-to-date balance per customer. Multiple QuickBooks Online Accounts – If you have multiple QuickBooks Online accounts, no problem! You can connect those various accounts to ConnectWise Manage and even set default ConnectWise Manage locations for each QuickBooks Online account to make for faster processing. Sync Statistics – Gain visibility into your financial data with interactive graphs to visually review the transactions included in your batches. Multi-Currency – Easily support multiple currencies across ConnectWise Manage and QuickBooks Online. Integrated Support – Contact your consultant quickly through an online form that can automatically attach your log data for their review. The QuickBooks Online ConnectWise Manage Integration is certified via the ConnectWise Invent Program. If you need assistance with integration implementation, please send a note to Help@ConnectWise.com. The ConnectWise Manage support team will work with the Gozynta team to resolve any issues. Have had great success using this. It takes some setting up, but once you have it setup everything seems to work great. Lauren Cullen, Carolina Phone and Data Services, Inc. I sometimes experience errors when importing invoices due to the QBO setup. However, they are usually easily fixed and the support is great. Setup can get tricky with sub-accounts, but the integration typically works well and with few issues. This does not work very well. All services go across to Quickbooks as a generic "service" line on the P&L. I am told there is no way around this. If you have services and bill time, and need to show those different services in Quickbooks, this is not a good solution.